Reload all Cash Passport cards on this new look website. Take advantage of the smarter prepaid travel money card that gives you the freedom to lock in your exchange rates, manage and reload funds anywhere, anytime online. Lock in exchange rates each time you load and reload. Load up to 10 different currencies on one card: NZD, AUD, EUR, USD, GBP, JPY, CAD, HKD, SGD and AED. Manage and track your Cash Passport on the go via your mobile, tablet, laptop or PC. Login to 'My Account' and stay in control of your travel money. Use your Cash Passport like you would a credit or debit card, except with your own prepaid funds. In-store, online or to withdraw local currency at ATMs. Protected by chip, PIN and signature. Cash Passport is also protected by Mastercard zero liability. Focus on the fun of travel. Stay in control, outsmart travel money. 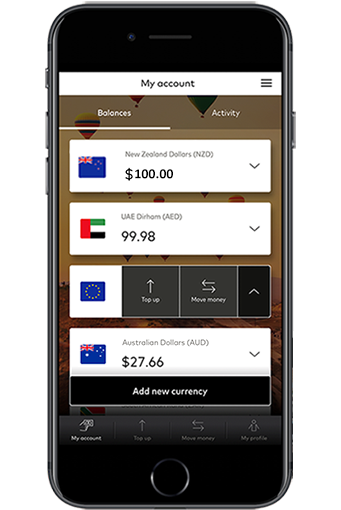 Move money between your currencies with just a couple of taps – it’s that simple! Quickly move money between 10 currencies, including EUR, USD, SGD, CAD and GBP and spend more time enjoying your holiday.